I live in a city centre flat and while I don't have a garden, I do like to bring some of nature indoors. I don't have any pets either so it's a great way to have something living in the room with you. As well as adding a bit of life, houseplants can actually improve the air quality and even provide you with ingredients for your kitchen. They also make wonderful subjects for photographers and I'll certainly touch on that. 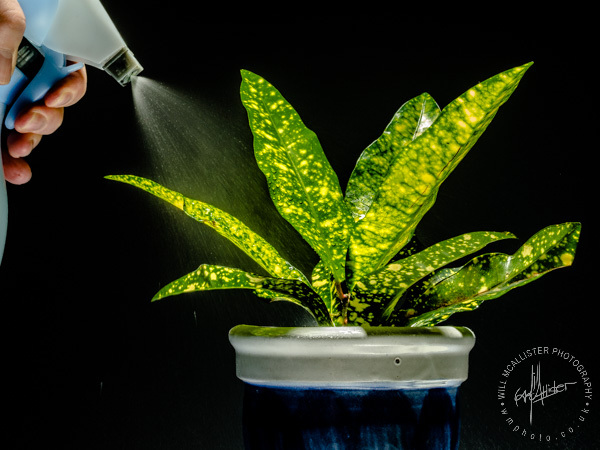 Regular misting is one of the best ways to keep houseplants healthy and vibrant. 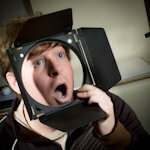 Why am I talking about houseplants on a photography blog you might ask. Well I really like houseplants, and growing them, caring for them and decorating my flat with them is probably my secondary hobby after photography, so it's something I feel I can say something about; I see no reason to write exclusively about photography, and talking about houseplants was a good excuse to take some photos of them. A lot of people though ask me how I manage to keep them alive, sure that any plant that enters their house will be dead within a couple of weeks. People assume that the plants must be high maintenance, and that looking after them will be a lot of work but in truth, with a few notable 'difficult plants' such as Codiaeum, most plants are easy to look after and people are simply falling into the same few simple mistakes which can be easily fixed. Pick the plant for the location. "Don't buy a plant that needs full sun if you only have a north facing window"
It's important with any houseplant that the location you pick out for it provides it with the correct amount of light, heat and humidity and it's also important that you water it and feed it with the frequency it requires. Most plants sold have a little label telling you what they need, read this before you buy and make sure you only buy plants that you can care for. Assuming you already have an idea of where you will put the plant, you should rule out any plants which won't be happy there before you leave the shop. Don't buy a plant that needs full sun if you only have a north facing window, or a plant that needs an unheated room if you don't have a porch and don't buy a plant that needs constant watering if you don't want to be able to leave it alone for long periods. Some plants are extremely fussy and will die within weeks if their exact needs aren't catered to, while others described as hardy or robust will tolerate a broad range of sub-optimal conditions. Plants are available for all conditions, there are many which wouldn't survive in full sun and actually prefer to be in a shady corner indoors. As it's useful to know a little more than the basic details usually contained on the label, and as in some cases there is no label, and some shops have a tendency to stock plants which are actually very difficult to care for, I like to take a reference book with me when shopping for plants so that I can be sure I'm only buying plants I can actually keep. Many more plants are killed by overwatering than underwatering. The soil in their natural environment is not constantly wet, it doesn't rain every day and yet many people will water their plants daily, or every other day and when they notice the plant is struggling, assume they aren't watering it enough and start watering it even more. Too much water will usually cause the plant to rot from the bottom up and an overwatered plant is often beyond rescue by the time you notice whereas an underwatered plant will usually perk up when watered. For simplicity's sake you can put most houseplants into four categories: Those for which the compost must be kept moist, in which case you need to add more water before it dries completely, those which you should water only when the compost has dried out, those which are low maintenance and you can wait for the plant to indicate it needs water by drooping, and cacti and succulents which need hardly any water at all. For most plants they will also require more water in summer. The air inside a typical home is of a similarly low humidity to desert air and most plants evolved in much more humid conditions. For this reason, insufficient humidity is another common cause of death for houseplants. The easiest and most effective way to do this is to regularly mist the plant but very few labels make any mention of humidity at all. Since the air inside is so dry, there are very few plants which don't benefit from steps to increase the humidity around them and even fewer that you can kill with too much humidity. With the exception of cacti and most succulents, you can assume that all your plants will benefit from frequent misting, though be careful not to mist plants in full sun or the water drops will act like tiny magnifying glasses and burn the plant. Other techniques include placing the pot on a tray of pebbles kept topped up with water, placing the pot in a second pot surrounded by damp peat or grouping plants together. I have a couple of particularly needy plants on pebble trays but mostly I just mist daily. It helps to put plants in locations that are suitable for me to just spray them where they are, such as on a windowsill with no books or electronics or anything else I don't want to get damp. With most of my plants positioned like this, it only takes a few minutes to walk around and mist every plant in my flat. Although there are many plants which can continue to plod along even if you never feed them at all, there are also a few plants which will slowly die off without feeding. Most fruit or flower bearing plants won't show such delights if you don't provide them with food and other plants will become spindly and unattractive. You can get liquid plant food and add it to the water every now and again when watering them, or alternatively you can get pellets which you mix into the soil once at the start of each growing season and then don't have to worry about it until next year. I mentioned before about taking a reference book with me when shopping for plants. It's a good idea to have one anyway, as it will provide more detailed hints and tips for things like feeding and humidity as well as lots of useful information for each individual plant about what can go wrong or what special requirements they may have and how to take cuttings. I would recommend the bible of houseplants, The Houseplant Expert, which was first published in 1960 and has been regularly updated since. Since this is a photography website, I should probably also at least mention a couple of ideas to ponder if you're going to also use your houseplants as photographic subjects. You can get pretty creative with them so my list is hardly exhaustive, but a good way to get started.